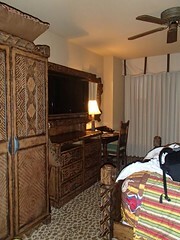 The 2014 Walt Disney World Marathon weekend was the first time we planned out a DVC stay 11 months out. We have done some non-home resort exactly 7 months out reservations (mainly Mik's 18th birthday at Disney's Grand Californian), but mostly we have not been too picky and have even booked just a month out like when we extended our 2013 spring training vacation to be able to see the Flower & Garden Festival and a D23 event. 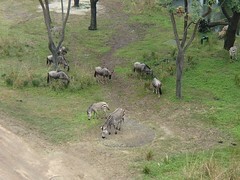 The marathon is something Dad has been interested in and it seemed the best type of trip to do a club level stay. 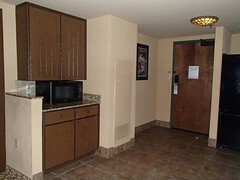 The entry and kitchen is nice and open. We are not into the drawer style freezers (we have one that came with our new house last year and we do not even use it there). Mik finds side by side the best, but drawer makes more sense than a top freezer accessibility wise. 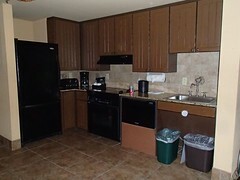 Mik said if he was actually going to use the kitchen he would have moved the trashcan and recycling bin elsewhere like by the door, but since we had the breakfast, snacks, cheese, and dessert times with the concierge club it was not like the kitchen got used by anyone this trip. The living room area has a sleeper sofa and chair. Also, small dining table with two chairs and a bench. The lighting is not really adequate except when your at the table or right by the lamps. 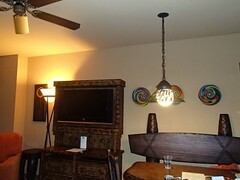 It would be nice if the fans were also overhead lighting. 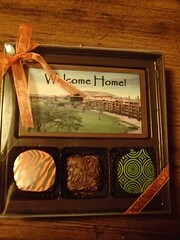 We enjoyed the box of chocolates that were there on check in. 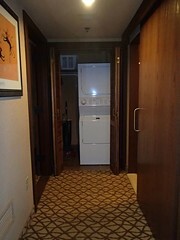 Laundry is located at end of hallway between the bathroom and bedroom. The accordian style doors are okay. The laundry machine certainly seemed loud when Dad had to dry his clothes (see bathroom issue below), but perhaps that is because I'm just used to having a real door to close between the washer and dryer and my bedroom that makes it barely noticeable being right next to them at home all the time. 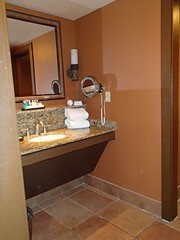 The bathroom has a sink area that can be separate from the toilet and shower area. The sliding doors for the bathroom areas are convenient and easy to use. Mik liked that he could roll up to the sink area, but found the sink somewhat tough to use as it was too far back from the edge. The extra toiletries of mouthwash, toothbrushes, toothpaste, and after sun relief are a nice perk that I assume is just for the club level. The funny thing is that for once I actually remembered to pack the travel bottle of aloe that we bought after a WDW trip a couple years ago and have kept with the travel toiletries since then, but I do not always dig down enough in the basket to remember to pack it. 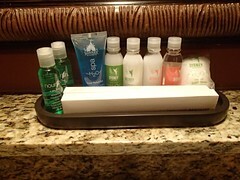 It is also the first time Mik brought his mouthwash on a trip. Mik found the grab bars good enough that he could almost use them to get on the toilet from the ground, except the floor was slippery at least when he had socks on. 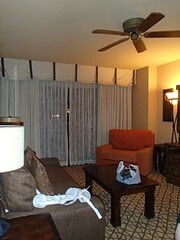 It was also not helpful that they put all the towels hanging on them. 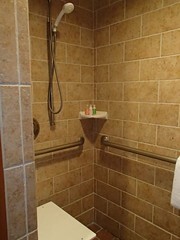 The bathroom could sure use some regular towel bars or at least a couple more hooks for hanging towels. 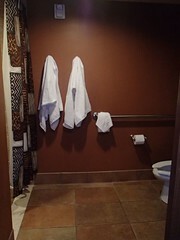 At first look the roll in shower seemed great. 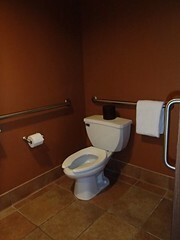 The bench was even located with the grab bar on the left, which works best for Mik. Also, the shower head was actually well-mounted and useable for a regular shower, too, which is not always the case as in our Saratoga Springs experience. The first time Dad used the shower, though, he flooded the bathroom. Now it just ending up in the toilet area would not have been too unusual, but it ended up in the sink area as well and worse Dad's clothes were on the floor there. Good thing there is a dryer in the room because Dad did not bring enough clothes this trip in the first place because he forgot to pack shorts. We ended up being able to avoid it from happening again by putting towels on the floor between the edge of the shower and the door between the sink area. 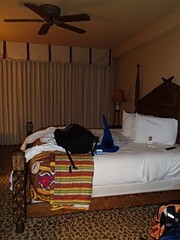 Not too big a deal in the end, although was quite disappointing that we told the concierge we needed it mopped and extra towels and got back hours later to nothing done by housekeeping, but at least at that point he personally got us extra towels and it dried to not needing mopping. Interestingly, when housekeeping did come later they ended up taking the extra towels, but magically two days later they actually made a dam of towels by the shower for us. The bedroom part of the villa worked out well for Mik and me with him having a nice area between the bed and the balcony door to be able to spread out and use his laptop on the floor like he likes to do. 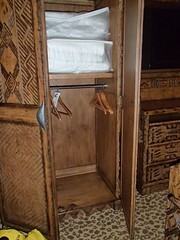 The low bars for hanging stuff in the armoire is a good accessible feature even if we did not need it. Mik's one issue with the bedroom is that there was just barely enough room for Mik to roll between the bed and the TV to get out to the balcony. He ended up not minding too much in the end, but said if we had brought his power chair he would have been annoyed because he certainly could not have used it to get out to the balcony through the bedroom. Thus, he ended up being kind of happy that his power chair was still stuck at home waiting on parts for repair. Access is technically not an issue from the living room, except we never folded up the sofa bed during our stay, which made that way out to the balcony totally unaccessible. 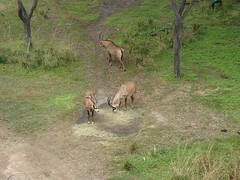 Of course, we would have just put it away daily if that was the only way out to the balcony, as he did enjoy going out there to see the animals almost daily. (Update: Later realized the living room entry to balcony actually has a lip to go over with the way it is a sliding door versus an actual door from the bedroom, so actually more of a hassle than just having to have the sofa bed closed up).